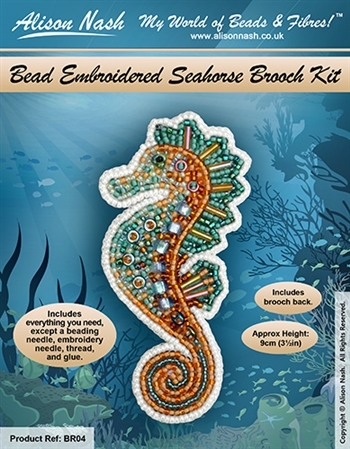 Make your own bead embroidered seahorse brooch with this full kit! Includes everything you need to make the brooch, except a beading needle, embroidery needle, thread and glue. Easy-to-follow instructions - suitable for complete beginners as no beading experience is needed. Simple step-by-step instructions with lots of clear colour photographs to help you. The design is printed on fabric for you to bead onto.